Tagline: She gave him hope. He gave her life. found out I had them. “Why?” I raised my gaze to his face, expectantly. powers not too long ago,” I argued. it?” I asked him in desperation. face between his palms, and crushed his full lips to mine. It’s a little of both, honestly. There are times when the characters take over and I let them guide me. Other times, I plan things out carefully to make sure everything adds up and makes sense. 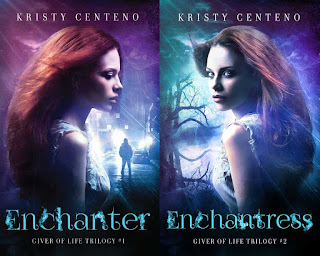 Enchantress is part of the Giver of Life trilogy. Book 2 to be exact. This trilogy has been a true labor of love/hate for me from the start. When I first published book 1 of the trilogy back in 2012, I was intent on completing the sequels. But something in me wasn’t entirely satisfied with the story. At the time, I felt like I could do better, so I put the entire trilogy on the backburner and moved on with other projects. Five years later, the rights for Enchanter (book 1), were reverted back to me and it was then that I decided I would turn Leah Parker’s story around. The Giver of Life trilogy was an uphill battle for me because as a writer, I wanted to put out stories that I felt readers would want to indulge in. Yet, I felt as if I was writing what I thought others would want to read instead of what I wanted the story to be. I debated what to do for months. In the end, after consulting with my significant other, I decided that if I was going to put a story out there, I had to be entirely satisfied with it. Otherwise, why bother? Enchantress takes a whole new direction than was initially mapped out and I’m okay with that. The second love interest was as intriguing to me as the first and rather than have him appear into her life only to be dismissed as it has so often happened in many books I’ve read, I gave him a more important role in the trilogy and in her personal life. The overall story leads you in one direction only to haul you someplace else just when you’re beginning to grow comfortable with the way things are moving along. Don’t say I didn’t warn you. It’s a gamble and I’m not sure how readers will respond to the way I decided to handle the love triangle, but I’m hoping they’ll at least enjoy the overall story. No. But I have started books I have yet to complete. When I’m plotting or writing down ideas I use a notebook and pen/pencil. But when I’m ready to bring the story to life I use my computer/laptop. Thank you so much for taking the time to stop by and getting to know a little more about me. I truly appreciate it. Happy reading everyone! My teenage granddaughters would love to read this. I love the covers for both books they are so rich and lovely. They just draw me into the book. Congrats on your tour and good luck with your book. It sounds wonderful. How long does it usually take you to write a book? Do you aim for a set amount of pages/words per day?